You need to give Minecraft more ram/permgen space. I just entered the Nether for the first time and all of the items that were on my hotbar have disappeared. Like, totally gone. I re-logged and they're definitely not there. Great modpack so far, except for one thing, I logged on today and my Dayblooms and Hydroangeas, six of each, where gone, not sure if this was just my bad luck or a random bug. Funny thing is the Endoflames are still there and they where placed just a few min after I placed the other two. I have logged off and back on to see if it was a glitch but they are still gone, however it shows my Endoflames and my mana pool as unknown as if they where just placed. That's what I was thinking (since the front page of the quest book also states that not everything is finished). It's been really fun so far though (except the grinding for the Magical Crops quests ;P)! Just noticed there are still some quests you can do, you just need to find magical chalk. Hey, I seem to have gotten stuck midway through the modpack. I don't know if this is where the current content stops and I'll have to wait for an update or if something's wrong. 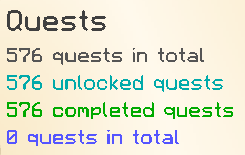 All the quests havent been added yet. Hopefully i can get more added soon though, been a bit busy lately. Thanks for the advice. Using Opis, I've figured out that the lag is caused by a Herobrine entity (from Headcrumbs) which is standing around in a mineshaft near my base. No idea what's going on. The problem is, if I use Opis to kill it, or even go there and kill it myself, the lag disappears for a couple of seconds, but then the game freezes. Maybe get rid of it by setting the game to peaceful? Or using /cofh killall? The only other thing I can think of is that something in the world is corrupted, like a chunk or something. Hi, I've been greatly enjoying this pack so far, but recently I've run into some problems which I can't diagnose or solve with my limited technical knowledge. I'm not even sure if it has something to do with this pack itself, but since I've never experienced such problems before, it appears to be as good a place to start as any. The thing is, at some point, my world started to lag as hell. I'm playing SP, and I had some simple automation going on with golems and some Botania, nothing fancy. Then, I don't even remember exactly what I did, everything startet lagging so badly that I had to wait seconds for a door to open after klicking it, and breaking or placing blocks is next to impossible. Chunk updates are around 0, but I have 60 FPS. CPU and memory usage was within normal paramters, btw. I've found this in my fml-client.log: [14:21:36] [Server thread/INFO] [FastCraft/]: The server is lagging 316844 ms behind, 5336 ticks will be skipped. Seems like a lot of lag. Does anyone have any idea how to even find out what's going on here? I've already tried picking up all golems, manaspreaders and tick rate changing entities like growth pulsers, but it didn't change anything. I've tried deactivating Mystcraft (which had started profiling, even though apparently it should only do this once per world) or Journeymap on a copy of the world, but no effect. Incidentally, when I started a fresh world, everything worked just fine. It's used to profile the server to find the causes of lag. Also I can't seem to add any modifiers to my tinkers tools which are all iron except a steel pickaxe. I tried in the auto tool forge and the normal one. You have to use them and level them up to unlock modifier slots. Any easy way to do thaumium ingots? PS: When do you think the modpack will be finished? Hmmm... In the Fire Essence seed infusion it calls for 4 lava crystals, but doesn't actually consume any of them. Intentional? I guess it would leave one for each crafting recipe it is included in (Lava Sigil, Volcanite Amulet, Weak Activation Crystal) and one left over for use in furnaces and the like. I seem to have stumbled upon what I'm guessing is a biome id conflict. In the overworld I've discovered a small patch of Twilight Forest's Mushroom Forest biome (complete with lapis-topped obsidian pillar and TF animals). Also, immediately adjacent is an Eldritch biome which I've never seen before. I just want to say how much I'm enjoying your pack. I can tell how much time and effort you have spent in it, and is super appreciated. I'm enjoying even more than Infinity Expert Mode, and having ProjectE as late late game prize is a lot better than creative energy cell or similar. PS: I have a couple of suggestions, should I post them in this thread? Hi, just want to say this looks like a great pack so far. Haven't got far yet but I enabled edit mode just to have a glance around the quest book and noticed that, under Useful Utilities, there is no quest for the Pseudo-Inversion Sigil. I know you're not finished with the quests by any means but I thought I'd get my request for this in now. Also, would you consider someone adding Logistics Pipes to be breaking the balance of the pack? I will be adding a quest for that eventually. Logistics Pipes shouldnt break things too badly, I dont think. So I just did some quick calculations here on the power output of the advanced solar generator compared to its component parts and I found something... off. The 4 solar generators and 1 solar panel used to make it produce a maximum of 576 RF/tick, while the advanced solar generator only produces up to 400 RF/tick. Other than the solar evaporator, why would we even use the advanced solar generator, which is more expensive, if it generates LESS power then? Also, before I forget, is it normal for a vein-mining pick's head to be black and be unable to re-name it? - You answered your own question. - Yes the veinminer modifier changes the texture of the pickaxe, and I don't think you can rename a pickaxe once it has been made/modified. Looks like something bad happened to the HQM Questing Data. My best suggestion is to restore from an earlier backup of the world. If this happens again after restoring from a backup let me know.